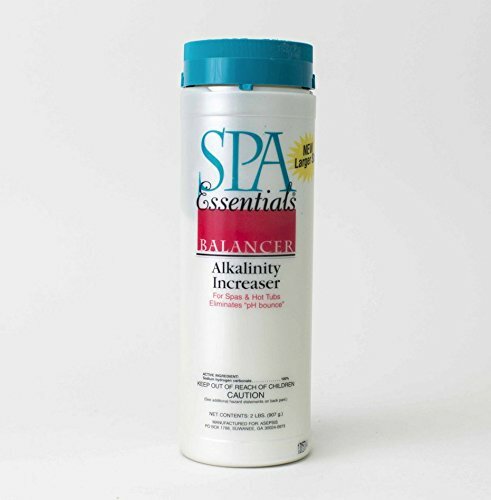 Spa Essentials 32538000 Total Alkalinity Increaser Granules for Spas and Hot Tubs, 2-Pound by Spa Essentials at List It Fort Lauderdale. MPN: 32538000. Hurry! Limited time offer. Offer valid only while supplies last. The carbonates in water help stabilize pH. But both the heat and aeration of spas drive out carbon dioxide. Consequently, pH in spas tends to rise. The carbonates in water help stabilize pH. But both the heat and aeration of spas drive out carbon dioxide. Consequently, pH in spas tends to rise. If pH is outside the recommended range it can cause problems: Swimmer Discomfort (Bloodshot eyes and irritated skin can be signs of a high or a low pH,) Equipment Deterioration (High pH forces minerals into solids and forms scale. A low pH will corrode equipment and the spa interior,) Chemical Inefficiency (Chlorine (and to a lesser extent bromine) residuals become less active at a high pH and overly active at a low pH. Although bromine operates in a wider pH range than chlorine, it's still a problem if pH is excessively high or low,) and Water Clarity (High pH can make the water cloudy.) Since spas are smaller, holding fewer gallons of water, pH changes caused by people and chemical treatments are more dramatic. So to create a spa environment that is truly safe and relaxing, you have to control these pH fluctuations through having the proper total alkalinity level. 100% Sodium hydrogen carbonate. If you have any questions about this product by Spa Essentials, contact us by completing and submitting the form below. If you are looking for a specif part number, please include it with your message.